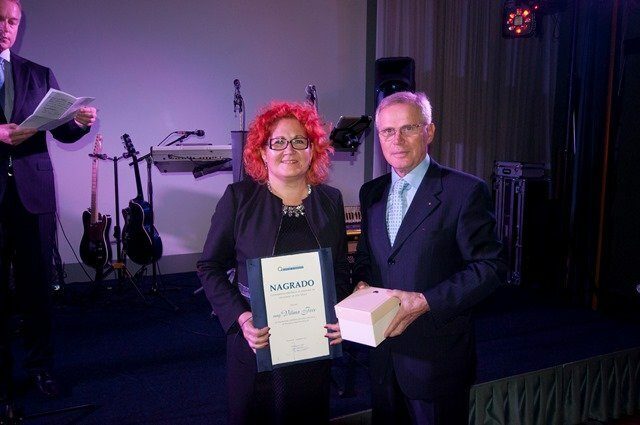 At the conference of the Slovenian Quality and Excellence Association (SQEA), held on the 13th and 14th of November 2014 in Portorož, the annual SQEA award ceremony took place. The SQEA award is presented to an individual for their long-standing work in the field of culture of quality dissemination and the SQEA mission. Fort the year 2014 the award was presented to Vilma Fece, Occupation health and Safety Manager in Gorenje, for the long-standing successful work at the implementation and promotion of environmental protection. Her 30-year work in the field of environmental protection in Gorenje and the company's results achieved in this period have been pointed out at the presentation. At the same time the award is an acknowledgment of her long-standing work with youths and of her promoting the awareness about the environmental protection in Slovenia and beyond. SQEA also presents an award to an individual for their contribution in the last three years and an award to a group of members for a successful implementation of a useful practice, process, service or program that presents a breakthrough in the area. The individual award was presented to Emil Nanut, manager of Gorenje's daughter company Kemis, for an exemplary leadership of the organization by using the management systems.